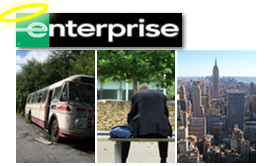 Enterprise Rent-A-Car : The Story That Everyone Wants to Hear! Have You Heard the Joke About a College Grad, a Bus, and a Resume? I had just graduated college and I was ready and eager to interview with companies in Corporate America. I was hoping to land a great job in New York, living only 40 minutes outside of the greatest city on earth (OK, I’m biased). I received a call from Perrier about a position in their NYC office. I did a solid job on the phone interview, and I was asked to visit the Manhattan office for a second interview. Cool. I’m excited. So, I had 2 decent choices for getting into NYC from where I lived, the bus to the Port Authority and a train to Hoboken where I could pick up the path to midtown. Being completely inexperienced with commuting to NYC at the time, I chose the bus. I won’t explain all of the intricacies about why the train is better, but to me, the train rules. So, it’s a hot and humid summer day in NY (more on this later), I’m dressed in a new suit that doesn’t really fit well, and I’m off to Manhattan for my interview, ready to take on the world. I hopped in my car and drove into Manhattan like a bat out of hell. I was lucky…I didn’t hit much traffic. I flew through the Lincoln Tunnel, parked near Penn Station, and ran into Penn Plaza. I even got to the office with a few minutes to spare. The hiring manager actually needed a few extra minutes to finish another interview. Phew…no problem. :-) “Tell him to take his time”, I said to the receptionist. That’s when I learned a great lesson that I’ve taken with me to this day. No matter what happens before a sales call or meeting, how hard it is to get there, what happened on the way, heck, what happened on your way up the elevator, nobody knows that… You just need to perform to the best of your ability in the moment and deal with any circumstances later. Anyway, I didn’t mention what happened with the bus to the hiring manager, I did a great job on the interview, and I was pushed to the next level, which was an interview at Perrier headquarters with the Regional Manager. To make a long story short(er), I landed the job and spent the next 7 years at Perrier. Those 7 years truly helped build the entrepreneurial platform that I use every single day. They gave me the best training, education, and real-world experience necessary for me to grow professionally. To me, my experience working at a large company that was going through tremendous growth, with the ability to learn, execute, test, while furthering my education, was critical to my success… Those 7 years definitely changed my life. That quote is directly from the Enterprise Rental Car website, and boy, do I believe that! See, what the manager of Enterprise Rent-A-Car did that summer day truly impacted my life. It’s not a corny cliche, it’s real life. He didn’t need to drive me anywhere… I wasn’t a customer at that point, and never had been. But, he went above and beyond…actually he went way above and beyond. Think about it, how many of your employees would do what he did?? Not many, right? I ended up writing a letter to his Regional Manager about my experience and I hope they plastered that story all over Enterprise Rent-A-Car Land. He deserved to be promoted…and that very day. And of course, I followed up with him to thank him another dozen times. 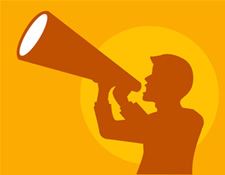 Word of Mouth Marketing (WOM) has become a hot topic over the past few years in marketing. The web has helped foster the explosive growth of WOM, since it’s a powerful catalyst for spreading the word to targeted individuals in mere nanoseconds! Many companies hear about “empowering customer evangelists” and they want to jump right in. Of course, it’s not that easy, but it is a powerful marketing channel that I recommend to most of my clients (if it fits). More on that later… In my experience over the past 13 years, I have seen how the power of WOM can impact a business. It can be a powerful driver of buzz and sales, to say the least. So why do some products connect with customers and others sit in what I like to call “WOM Limbo”? Let’s face it, some products seem to start a fire under customers and others wander by, simply as part of a business transaction. So, what drives WOM in customers? I’ve thought about this a lot over the past 4 or 5 years as WOM has grown in popularity as a marketing channel. In addition, I’ve helped clients try and harness the power of WOM to grow their own businesses and I’ve also kept a close eye on the industry. Last, but definitely not least, I’m a customer evangelist myself, and proud of it! When I find something that impacts my life, I love to tell people about it. So, my consulting, research, observations, and my own experiences as a customer evangelist helped me identify some of the key drivers that cause people to buzz about their favorite products and services. Note, this is obviously not a complete list of all drivers of WOM, but it’s a good start. Meaning, a product or service enables you to do something that you were never able to do. DVR’s come to mind. How many people are ridiculously busy now with work, kids, social life, etc? VCR’s didn’t cut it, and people were not able to catch the shows they wanted to see. Hello TIVO, and now hello DVR’s from every major cable company. When I bought my first TIVO, you couldn’t shut me up. My wife literally had to put a Hannibal Lecter-looking grill on my face to shut me up! :-) Note, you can read more about my adventures with TIVO and the Comcast HD DVR here. The bottom line: Enable customers to do something that they could never do before, and it can be a huge driver of word of mouth for your business. Do you know someone who always wants the latest and greatest product? I do, and these people are buzz engines. For example, they buy the latest gizmo and want to tell the world about it. iPods, iPhones, Blu-ray HD DVD players, HD TV’s, and gaming systems like Xbox all come to mind. Not only do early adopters buzz about their latest gadgets, they typically have a platform to drive the message. Can you say blogging anyone? A Small Business Tangent: When I think about small business WOM, the party supply store in my town called Party and More comes to mind. It’s run by a woman (Denise) who truly gets customer service and word of mouth. The first time I was in her store, she spent time speaking with my 3 year old daughter. She gave her a free balloon and was genuinely interested in my daughter’s stories. Then, I saw Denise after my son was born and she gave me a display of balloons for my wife, and also spoke with my daughter about the new addition to our family. Actually, I didn’t even know that Denise owned the business since she was spending so much time with me and my family! Now every time we go to that shopping center, my daughter asks if we can go see “the balloon lady”. And we often do… I also jump at the chance to tell people to go there. 4. It’s So Close, You Can Taste It….So to speak. If a product or service positively impacts the health of customers, they tend to want to tell the world. Stories of people diagnosing a problem on WebMD, even when their own doctor didn’t catch it, will drive more people to the site. Omega 3 pills are another good example, with studies showing the impact on mood, brain power, retention, memory, cholesterol, etc. Diets are another good example, since one person that successfully loses weight can drive hundreds or more to the try the same style of diet. We’ve all seen that happen, right? Or, how about the latest craze, Dr. Oz on Oprah. Now, would Dr. Oz be as popular today without Oprah? Probably not, since she was the catalyst for his explosive growth. That’s the power of a famous influencer. More on influencers later in the post… WOM has taken over with Oz and many people are talking about him now. So, it looks like you’re not in Kansas anymore Dr. Oz. So, those are 7 key drivers of WOM. Again, this wasn’t meant to cover every driver of WOM, but it’s a start. I plan to expand on this topic in future posts, so stay tuned. But I’d like to hear from you now. Does your product or service fit into one of these categories? Or is it in WOM Limbo for some reason? I’d love to hear your thoughts. This past weekend I attended an annual Fall Festival that’s held in my town. It’s a fun time of year in the Northeast, with great weather and Halloween just around the corner. Anyway, there were a lot of people at the festival and a lot of activities, including a section dedicated to local businesses. You know, where businesses can set up booths and interface with prospective customers. I decided to take a walk through this section, and I can tell you, at least half of the people manning their booths shouldn’t have been there in the first place. As I walked by each booth, I began to question whether these were the marketing people who thought it would be a good idea to set up at the festival or if these were actually the salespeople. And, I couldn’t help but think of the stark difference between sales and marketing. A few people were on their cell phones, others were talking with their coworkers and not engaging the crowd, and other booths were flat-out empty. Keep in mind, there were a lot of people at this festival… Luckily there were a few salespeople that I spoke with that were engaging, knowledgeable, and charismatic, which was a breath of fresh air, so to speak. ;-) Although the words tend to be thrown around together, sales and marketing are two very different areas of focus, requiring extremely different skill-sets to succeed. In a nutshell, a marketer is the person responsible for researching a product or service, exploring target markets, mapping out price points based on several business factors, branding products and services, developing and analyzing campaigns, and yes, helping salespeople understand the unique selling proposition for each product. There are some ultra-talented people in marketing that couldn’t sell their way out of a paper bag. 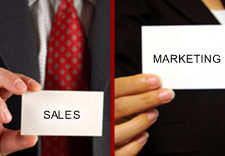 On the other hand, a salesperson is the connection between marketing and prospective customers. Salespeople live to sell, love to present, look for sales opportunities all of the time, and are highly driven people who risk a good part of their income on their own sales ability. They close deals, period. That said, there are some outstanding salespeople who couldn’t market a product if their lives depended on it. Remember, not “sell”, but “market”. I’m a big World War II buff, so here’s one of my war analogies. If a marketer and a salesperson were on a battlefield, the marketer would be mapping out the best possible strategy for success and then handing it to the highly skilled salesperson responsible for charging the hill. In war, if you mix the two up, people die. In business, products and services fail, and people get fired. In general, you don’t want your marketer selling and you don’t want your salesperson developing the marketing plan for your product or service. Note, I said “in general”, since there are some people that are both salespeople and marketers… It’s rare, but there are a select few. You definitely want your marketer involved in helping your salespeople craft their presentations, explain the core selling points, provide data for overcoming barriers, etc. and you want your salespeople working with your marketers to learn what’s going on in the field. But overall, the marketer should market and the salesperson should sell. Most marketers would have no idea what to do in a sales presentation and most salespeople would have no idea how to market a product. Marketing involves tedious research and analysis, and a heavy focus on data. Sales involves extraordinary social interaction, presentations, inordinate amounts of motivation, the ability to travel where needed and when needed, and a serious sense of urgency to hit numbers. Some marketers sweat just thinking about presenting to a group of executives, where great salespeople jump at the chance. For many of you, your website is your top (and only) salesperson. Now, if you know great salespeople and know what they bring to the table, then you understand the enormous challenge you face in trying to make code, graphics, and web functionality achieve what they can. However, in an increasingly competitive online marketplace, that’s exactly what you need to do. You’re the marketer, mapping out your online marketing strategies based on extensive research, planning, and analysis. You work with your developers and designers to craft a persuasive selling system (your website) that helps prospective customers find answers to their questions, all while getting them more excited about your product. And, if you’ve done your job well, your chief salesperson, I mean your website, will help you land new customers. So the more you, as the marketer, understand the sales process, the better your website is going to be at meeting visitor expectations and increasing conversions. Because, you are creating a website that answers questions in a way that a top salesperson would. You need the right scent trails, the right calls to action, know when to provide more information, and know when to ask for the sale, which is not easy, considering your website doesn’t have the ability to crack a joke when needed or shake someone’s hand. Or can it? So, although sales and marketing are very different areas of focus, both should work together in web marketing to optimize your efforts. Marketers, learn from your salespeople, and salespeople, learn from your marketers. Just know the boundary between the two. So, are you a salesperson or a marketer? Did someone add both words to your job title? Let me know what you think.